Building the Texas economy one business at a time. The Texas Gulf Coast experienced catastrophic devastation caused by Hurricane Harvey. 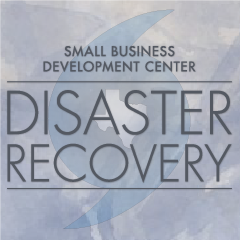 The South-West Texas Border (SWTXB) SBDC Network and affiliate Centers at the Del Mar College SBDC, University of Houston-Victoria SBDC, and Texas State University SBDC have coordinated with FEMA and the SBA to provide disaster assistance to small businesses in the affected areas. Some business owners are dealing with personal losses, in addition to varying levels of physical damage and economic injury to their businesses. Small businesses impacted by Harvey will face extreme challenges and will likely need to re-assess their business model and current and future markets. In addition, financial recovery, financial record reconstruction, and the management of accounts receivables and payables are all areas of business recovery that small business owners should begin considering. Business owners are encouraged to apply with FEMA to obtain a FEMA Registration ID Number and the SBA to apply for SBA Disaster Loan Assistance. Applying with FEMA and the SBA are necessary first steps to begin the business recovery process. © 1979 - 2019, UTSA Institute for Economic Development, All Rights Reserved. The Institute for Economic Development is funded in part through the State of Texas and a Cooperative Agreement with the U.S. Small Business Administration. Reasonable accommodations for persons with disabilities or limited English proficiency will be made if requested at least two weeks in advance.